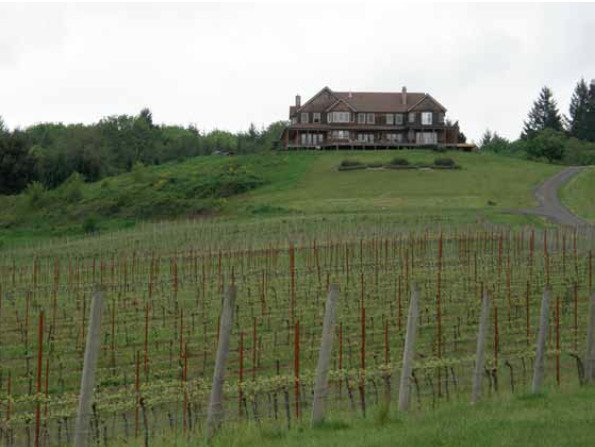 Youngberg Hill Vineyards & Inn consists of 21 acres of vineyards on a 50-acre hilltop property with panoramic views of the Willamette Valley. Located in the McMinnville AVA, the first 12 acres of Pinot Noir were planted in 1989 on two distinct blocks of southeast facing slopes. The vines are own rooted Pommard and Wädenswil clones. 4 additional acres of clone 777 was planted on 101-14 rootstock in 2008. There are also 5 acres of Pinot Gris planted in 2006. The 6.6-acre Natasha Block is located at about 600-675 feet elevation on Willakenzie soil (sedimentary). The 4.5-acre Jordan Block is higher at 750-800 feet and steeper, and is planted on Steiwer (volcanic) soil. This block is benefits more from coastal breezes, is cooler, and harvested later. The Natasha and Jordan Blocks were planted in 1989 and already in production when the Bailey family bought the property. The Camelot Block, planted in 2008 by the Bailey family, is dedicated to Dijon clone 777. It is located between the Natasha and Jordan Blocks and is a blend of the two soils. The Youngberg Hill Vineyard is located in the western reaches of the McMinnville AVA, only 25 miles inland from the Pacific Coast as the crow flies. The weather is most heavily influenced by the maritime influence from the Van Duzer Corridor. The vineyard receives more precipitation than most of the Willamette Valley, more sunny days, and cooler temperatures both day and night. Cool, coastal winds gently blow in the late afternoon and early evening reducing disease pressure. The vineyard is farmed organically and is LIVE and Salmon Safe certified, with some biodynamic practices in place. The vines are not irrigated. The Bailey family acquired Youngberg Hill in 2003 and renovated and upgraded the entire estate, with improved vineyard management and winemaking, expansion of the Inn, a new tasting room in the inn, and markedly improved hospitality. The house features 8 modernized guest rooms. Proprietor Wayne Bailey was a mechanical engineer who initially pursued a career in the food and beverage industry as a consultant. He became enamored with wine and turned his career eventually to the wine industry. He went to France on a short term consulting job for a domaine in Burgundy that wanted to export wine to the United States. He fell in love with Pinot Noir, became friends with many of the local vignerons, decided to stay in Burgundy, and worked two vintages. After his stint in Burgundy, he knew he wanted to grow Pinot Noir in a cool climate and Oregon was a natural choice. He bought Youngberg Hill and beginning in 2003 worked with the late winemaker Jimi Brooks who was the winemaker and vineyard manager at nearby Maysara Vineyards at the time. Brooks helped Bailey institute organic and later biodynamic farming at Youngberg Hill Vineyard. The wines are crafted in a shared facility by Youngberg Hill owner and winemaker Wayne Bailey, along with noted winemaker Robert Brittan acting as the consulting winemaker. Grapes are 100% de-stemmed, undergo a 3 to 5-day cold soak, are fermented with natural and proprietary yeasts, and aged typically 14-16 months in 28-30% new French oak barrels. The informative website at www.youngberghill.com offers the wines for sale. The tasting room in the inn is open 10:00-4:00 daily. The best idea is to check into the Inn for a few days and taste the authentic wines while you enjoy the ambiance. The Bailey family is posed below.